Hurghada Bay, 1 km. of private beach, ideally located in front of the Coral Reefs. Distance from Hurghada Airport is 14 Km. and 20 km. from Hurghada town.Constructed in 1990,Enlarged and renovated in 1995. 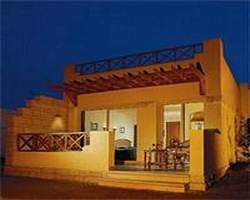 The village features a bungalow's style accommodation, Restaurants and bars, all overlooking the RED SEA. The resort provides 298 Bungalow rooms ( 213 twins and 65 doubles ) with Private terraces, Satellite color TV, Airconditioning, radio. 20 Suites with large bed, living room and large terrace. Several bars offering various styles of service and atmosphere, from the most casual one on the beach to a comfortable and cozy next to restaurants. Cafe Oriental gives an idea of real Egyptian way of comfort with typical hot and cold drinks; water-pipes (Shisha) games and TV. 2 Swimming Pools where water-polo and Gymnastic are taking place. Scuba diving center is offering various diving formulas, for novices or professionals. Water Activities such as: Snorkeling, Wind Surf and Glass-bottom Boat. Horse riding, Bocce, Backgammon, Chess and many other games. Oriental Shows, Animation and other entertainments take place weekly, in the Roman-Style theater or the Discotheque "LA TANA"